South End is home to the largest concentration of art galleries in Charlotte and a hopping local art scene. On the first Friday evening of every month, many neighborhood galleries (and often other retail spaces) will stay open late to host lively receptions for new art exhibitions with music, food and drink, and an opportunity to meet the artists. The galleries are always rotating interesting displays of everything from fine art oils and pastels, contemporary glass, jewelry and mosaic. 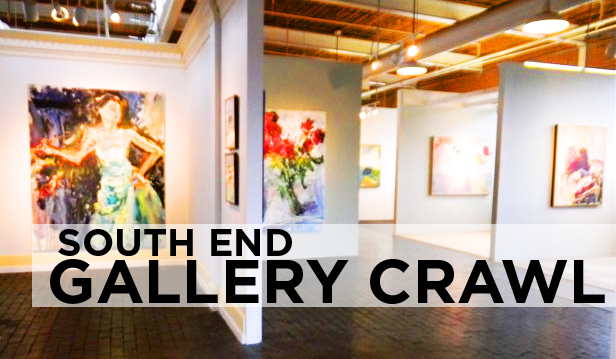 Charlotte Magazine has named the South End Gallery Crawl as the Best Artsy Place to Take a Date, and it’s easy to make a night of this award-winning event with shops, restaurants, and breweries around every corner. Check the blog and the calendar a few days before the Gallery Crawl for more specific information about participating locations, their hours of operation, and the new art on show. Public hours vary; check before you go.